A classic bike for touring, the BMW R 1200 RT makes riding through the countryside an absolute delight. It might be a huge machine, but its weight and manoeuvrability make it easy to handle. It offers everything a touring bike can, making its ride feel complete every time. Here is a brief review of this timeless bike in case you want to purchase this motorcycle. 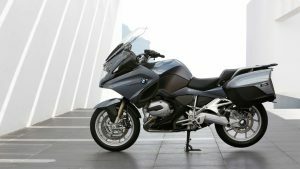 BMW keeps raising the bar for touring bikes and it did it again with the BMW R 1200 RT. The RT has a continuous tubular steel bridge-type frame which increases rigidity, thus improving handling. It has an Electronic Suspension Adjustment (ESA) and Automatic Stability Control (ASC), making riding a cakewalk. BMW added an optional Dynamic ESA semi-active suspension that automatically modifies damping corresponding to riding conditions. In addition to rain and road mode, ride mode pro is a new setting offered by BMW. It offers ideal throttle response and a greater margin of intervention from the traction control and ABS. It also incorporates Hill Start Control, allowing the bike to start on an incline as it engages the rear brake. The RT has a 58.5-inch wheelbase, making turning easy and responsive. The brakes are Brembo mono block callipers, accomplishing effective stopping power. The standard seat height comes in two variants, with the lower edition ranging from 29.9 to 30.7 inches and the taller edition ranging from 32.7 to 33.5 inches. The narrow waist of the RT makes it easy for the rider to touch the ground with their feet. The wheels are 17 inches, making it level, both front and back. It has a 25-litre fuel tank and a net weight of 604 lb, with an electrically adjustable wind shield. This ensures that riding long distances will go on without a hitch. The seats and the grip are heated which work very well. There is an onboard satellite navigation system, and a satellite radio, to keep you company through your long rides. There is an option called Shift Assist Pro (SAP) quick shifter. This enables clutch-less up-shifts and downshifts. Clutch-less downshifts are achieved by the ECU matching rpm to road speed for the lower gear. The RT has a 1,170 cc twin-cylinder boxer engine which produces 125 bhp at 7,750 rpm. The engine has air and liquid cooling to accord to the emission and noise regulations. It has a larger centrifugal mass, making the ride feel refined and smooth. The RT has a 6-speed gearbox with shaft drive. It also comes with a judder damper, located on the output shaft of the transmission. Another feature the RT has is the BMW Engine Management System. The air-to-fuel ratio, ignition timing, and idle speed are adjusted to ensure the engine is running efficiently and safely. Whether you are going for a short ride to the supermarket or for a long ride through the countryside or anything in between, the BMW R 1200RT is an exceptional bike. It comes packed with technology which has been developed with utmost care, launching the bike from a boring machine to a fun and exciting ride.